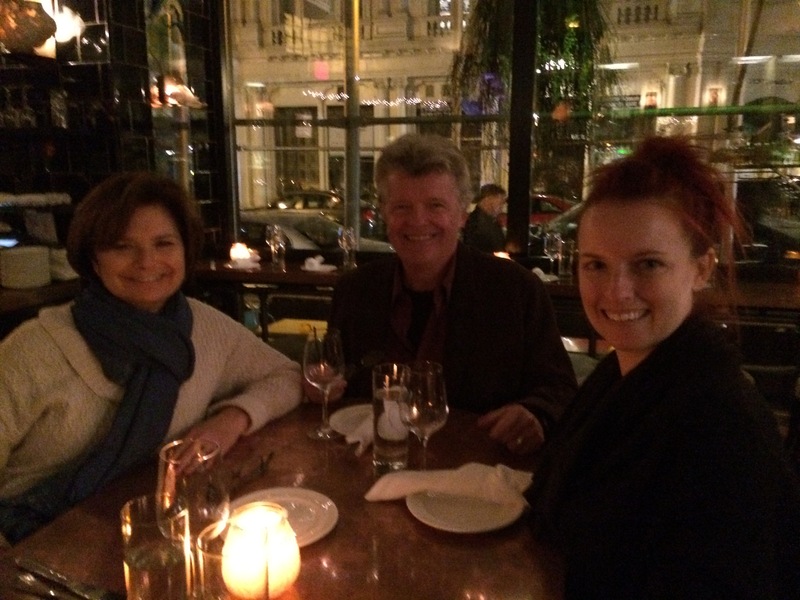 This past weekend, Dorianne and I visited Manhattan to see our daughter, Heather. 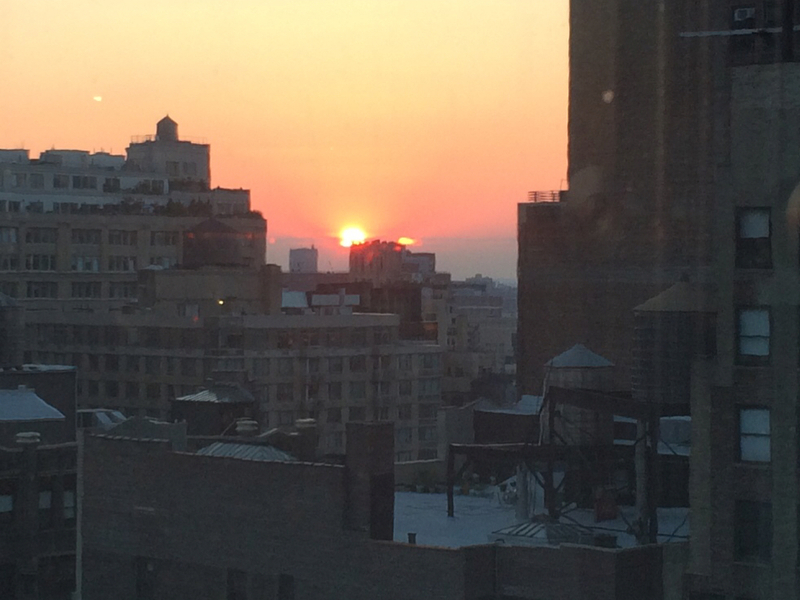 During our short visit, we had three dinners with wine and went to a rooftop bar atop our hotel – The Indigo Hotel on W. 28th Street in Chelsea. Friday, Heather made reservations at Giovanni Rana Pastificio & Cucina, known as Rana, located in the Chelsea Market (a must visit in NYC). Known for their fresh pasta and other Italian fare, the restaurant is bustling and noisy – in a good way. We had reservations for three and they put us at a table for six, which was fine because it was in a corner and allowed for our conversation to be heard without too much trouble. We ordered a 2012 Guado al Tasso Vermentino from Tuscany – a white wine to go with seafood pasta. It was the second Vermentino I have had – oddly enough the first was the night before at a friend’s home where we had a Vermentino from Tablas Creek in California’s Central Coast to begin the evening. I did not take a photo of the Sicilian bottle – both wines were light and crisp with a hint of spice. The Tablas Creek was perhaps a bit spicier, and the Guado al Tasso had more of a green apple taste, but they were very similar. I recommend both the restaurant and the wine. Saturday we went to the RoofBar at the top of our hotel (17th Floor) and watched the sun set and the lights of the city come on. Our wonderful bartender, Costa from Greece, showed us around the fairly spacious rooftop area, some covered and some open. The wine list is short, and features a number of Greek wines (the owner is Greek, we were told). We ordered the French Sauvignon Blanc – a “Lulu” 2013 from Touraine. It was everything you would want in a Sauv Blanc – crisp and fruity, with hints of citrus and lemongrass, but very well contained, unlike the wines from New Zealand, for example that tend to be heavily citrus based. 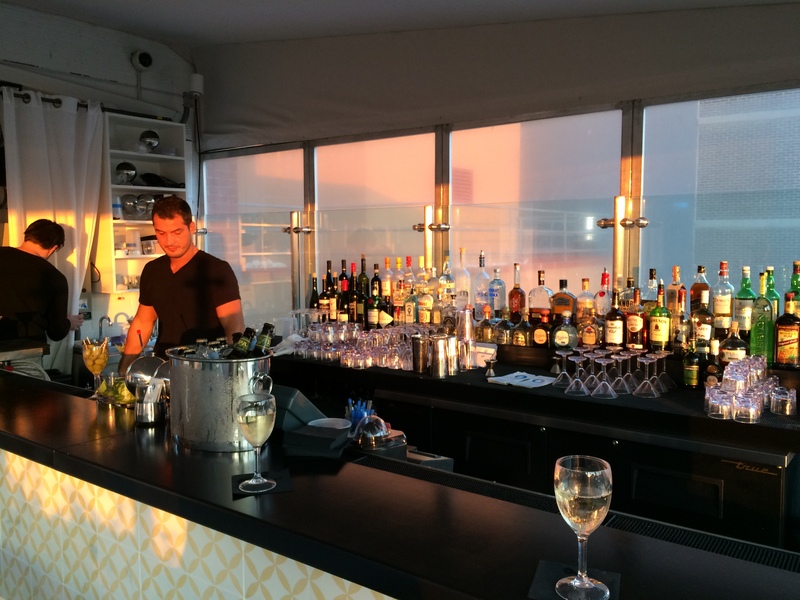 We returned to the Roof Bar on Sunday evening for a repeat performance of the sunset and some more Sauv Blanc. Costa behind the bar at RoofBar in Chelsea. 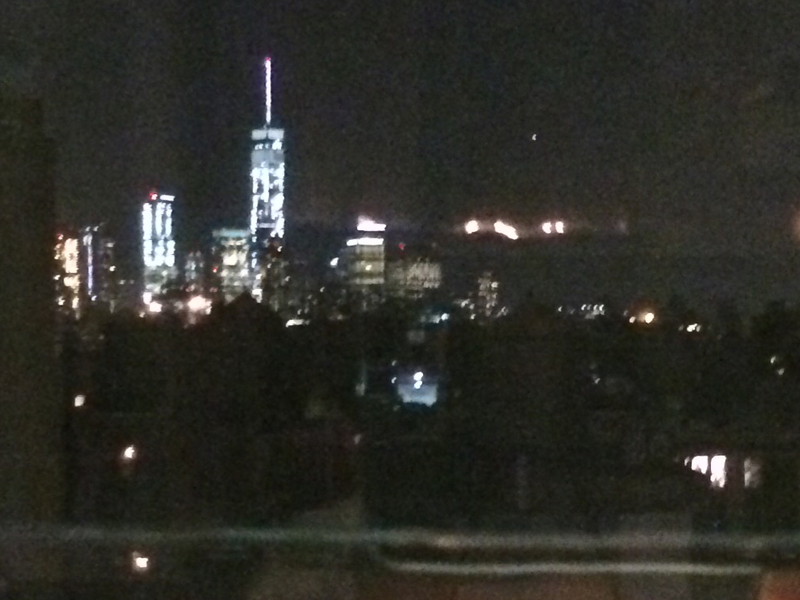 Night Falls on the City. Saturday dinner was at the Petit Poulet on 33rd Street off of Avenue of the Americas. 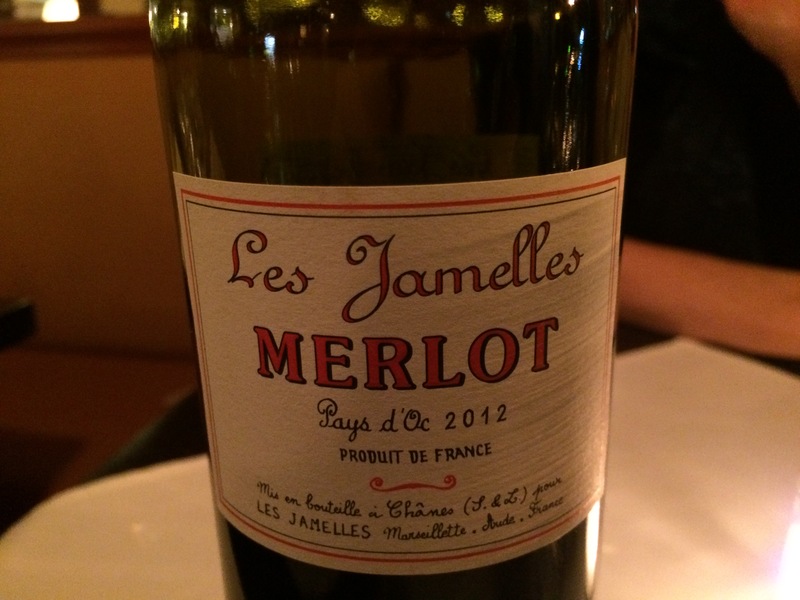 The food was classic French (I had steak frites) and we chose a 2012 Les Jamelles Pays d’Oc Merlot, which was recommended by our waiter, a classic New York waiter who treated you grandly if you looked like you knew what you were doing and were also appropriately subservient to his opinion. The wine and the food were both wonderful. The French Merlot at Petit Poulet. 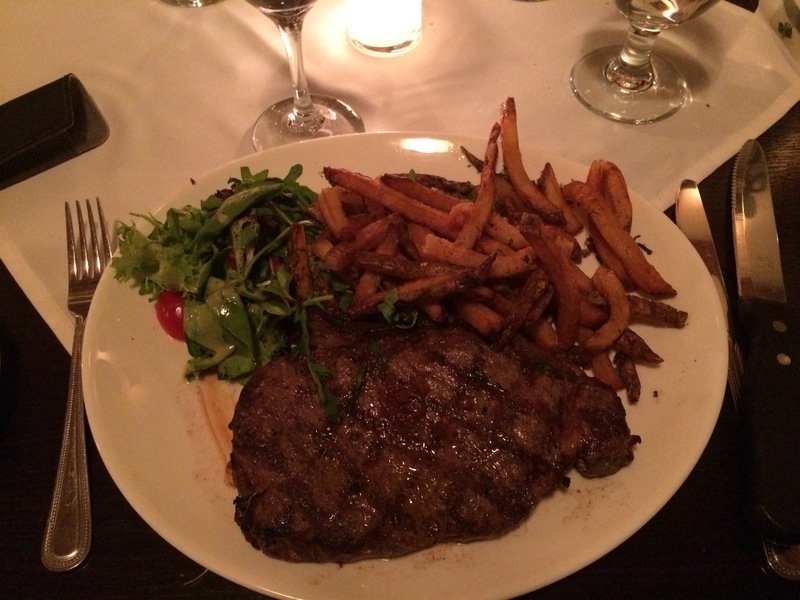 Steak Frites at Petit Poulet. 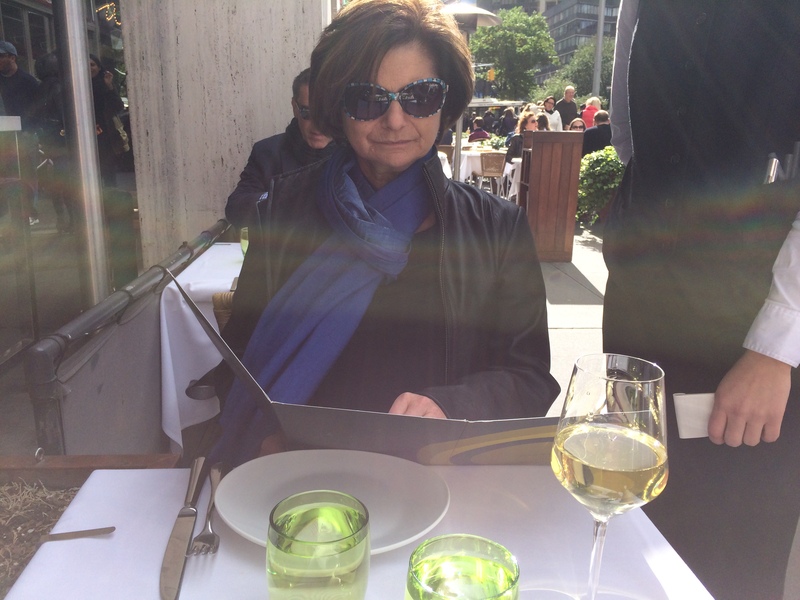 Sunday afternoon, we had lunch at BoludSud, a Daniel Bolud restaurant across from Lincoln Center, next to Bar Bolud. As you would expect, food, wine and service were impeccable. It was warm enough to dine alfresco, which was a bonus. I had a glass of 2012 Au Bon Climat Chardonnay while Dorianne opted for tea. Jim Clendennon would have been half-happy. Dorianne making her selection at BoludSud – my Au Bon Climat in the foreground. Sunday dinner, after our second stop at Roof Bar (which by the way, does not even have nibbles, which is unfortunate), we opted for the John Dory Oyster Bar at 29th and 6th Avenue. This is a beautiful restaurant with a very limited menu – shellfish based, as you might imagine. It is also the first restaurant that I have ever been to where I did not recognize a single wine on the wine list. The list is short, to be sure, but not a familiar winemaker in sight! There are four house wines that are “on tap.” The wine prices were, shall we say, sky high, so we opted for one of the on-taps and ordered a ½ carafe of Vinhos Verde (at $34). The wine was a fairly typical Vinhos Verde in my experience, young and raw – not very pleasing. It was ok with the oysters and clams that we ordered. This might be a good place to bring your own bottle. 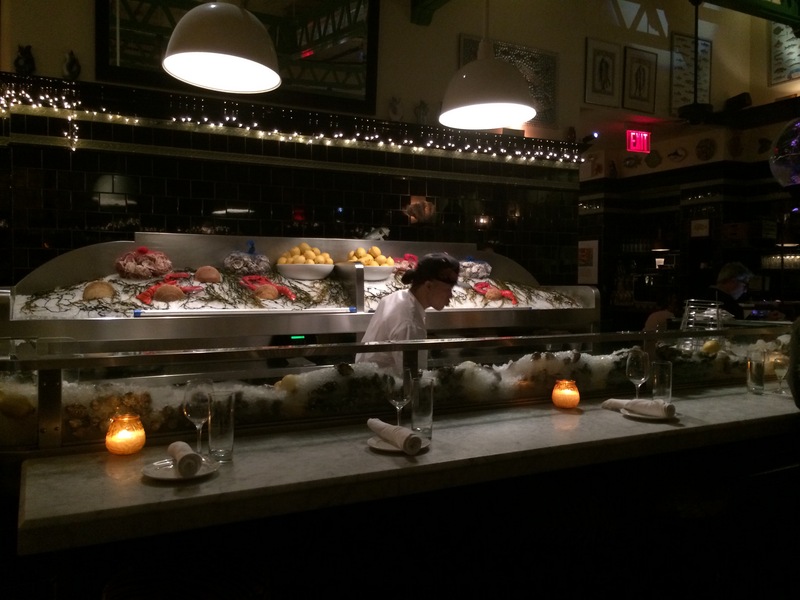 Where the Magic Happens at John Dory Oyster Bar. Waiting for our somewhat disappointing Vihno Verde at John Dory. Oh, and we went to Eataly – which may require another post even though we did not drink any wine. So a quick trip into town, a bit hit or miss on the wine scene (we did not plan around the wine), some good food, and uniformly good service. I look forward to a more wine-centric visit to this great city in the future.